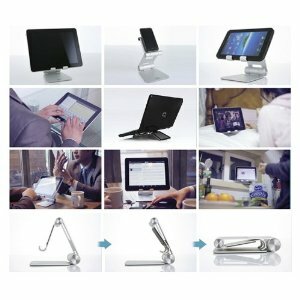 Check out this amazingly well designed and useful tablet stand, the Satechi R1 Arm Hinge HolderStand! Only about $49 on Amazon here. 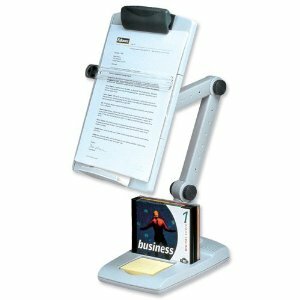 This stand allows you to tilt your tablet at a comfortable viewing angle and work hands free. 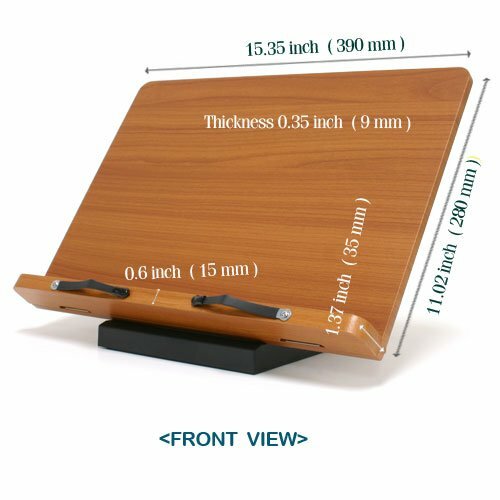 Satechi R1 is a desktop stand for any 7″ to 10″ tablet. Constructed from solid aluminum, the R1’s supporting grips are finished in rubber to hold your tablet securely in place. It’s compatible with most tablet cases. The R1 will hold your tablet at the right height and angle you determine to be for desktop use – useful for working with a Bluetooth keyboard, watching movies or video conferencing. Put your tablet in Portrait, Landscape or Flat-Angled orientation, change Height or Angle. Bic: This holder was better than I expected. 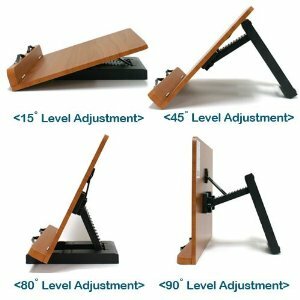 Susan A. Ferraglio: The r1 stand is well built, sturdy yet of moderate size. The included carrying pouch is a nice added touch. I like the stand because it has protective rubber linings at all the contact points for the iPad. There are so many comfortable positions for typing landscape or portrait mode. In a folded position the iPad is close to the table surface for typing at a desk, the stand can be raised so the iPad can be held up for movie viewing or photo slide shows. I use a Bear Motion leather iPad case (which I love) which I DO NOT have to remove when using the stand, Great convenience ! 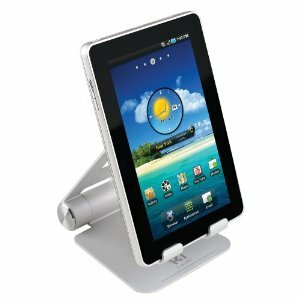 This stand is versatile because other electronics can be used as well. The iPhone fits nicely. It can held high for more comfort. I also used my 13″ laptop in it but the joints were not strong enough to hold the laptop up high. It worked well when the stand was closed. The laptop was kept at a comfortable angle for use at a desk. My only concern is the strength of the joints. They are very tight now. They easily hold up the iPad without moving. Over time they may weaken and I don’t see an easy way to tighten them if needed. Hopefully that will be a long way off. Build quality is very good. The finish is a satin-smooth finish – very even and clean. I would definitely recommend this stand for its versatility, size and multiple positions. I speak to clients all the time about neck and shoulder pain. I’ve posted many different tips on self massage and workplace tools to help keep you from getting sore and painful neck and shoulders. In the depths of the Chicago winter, I also tell people to keep their necks and heads covered and warm. When we are too cold, we tend to hunch our shoulders up and this can create tension in the upper back and base of the neck.So wrap an extra scarf around your beck if you need to. Keep your zippers zipped all the way up and add an extra hat or hoodie to keep cold drafts off your neck. Want more tips, read on below. 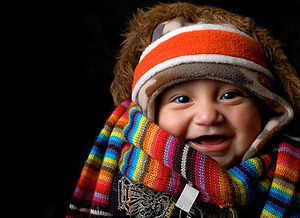 Read how to bundle up for winter from Ehow here. Here’s a fun article from Ecofriendly.com on making your own Knit Scarf. Click here for all the woolly details. Read Chinese medicine tips on keeping your neck and waist warm in winter and why. For the full article at the Examiner, click here. Read create tips n staying warm int he winter here from Outtakes.com. Recently I’ve had a lot of questions from clients about modifying their desks and workstations to help reduce back and neck pain. So I thought I’d list the top posts for ergonomic workspace solutions in one location. 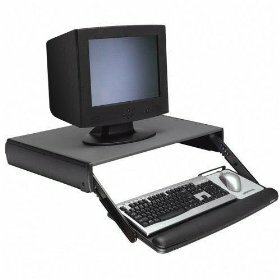 If you have an uncomfortable chair or need a keyboard tray but your desk doesn’t easily allow for one, read the posts listed below from this blog. Fit Your Keyboard to You Not You to Your Keyboard! 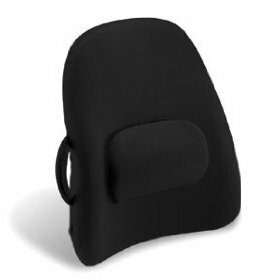 Great Backrest for People of Wider Girth and Gamers Too! Common shot of iPad showing only users lap. Image from Flickr. I’ve been noticing iPad advertisements all over town. I see iPads on billboards, ads on my computer and on television. Notice how the ads don’t show people sitting and using the iPad. They show people’s laps and legs and then a close up the iPad. Hmm, why hide the necks and shoulders of iPad users? 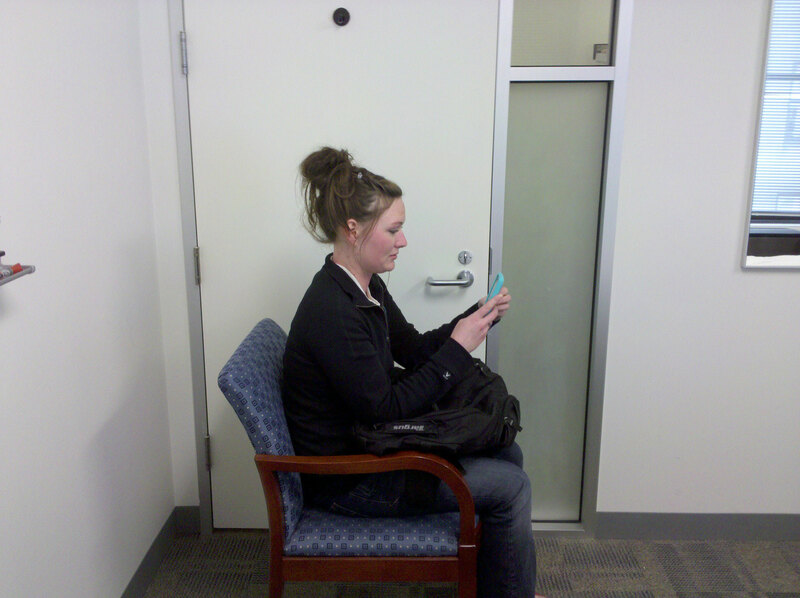 My guess, because sitting hunched over a small but relatively heavy iPad makes people look pretty uncomfortable. Ned Batchelder has a great post on the ergonomic issues of the new iPad here. Ned shows a video of someone using the iPad to make slides that shows just how awkward it is to use the iPad for data creation. Commenters say that hey, the iPad isn’t designed to be a data creation device but a data consumption device. Do we really need separate devices for each use? Don’t get me wrong, I am a huge Apple fan. I’ve been using Macs since they first came out (Does anyone remember the old SE30’s with the 9″ monochrome monitor. That’s where I started. And interestingly enough that’s about the time I started needing to see a chiropractor, too.) But as slick as Apple’s touch screen iPod’s and iPad s are and are, they really cause a world of hurt for users’ necks and shoulders. 1. iPad/iPod devices are small and relatively lightweight. So at first glance you may think, hey, it won’t hurt me, it’s a device under 1 pound. But that one pound gets pretty heavy if you hold it up over time. Try this exercise. Hold a 1 pound weight up in front of your body for 5 minutes. Bet you can’t do it. The 60 seconds may be pretty easy. But as the clock ticks, the weight gets heavier and heavier. Now think about holding that weight for an hour. Two hours. Even try holding just a real apple for ten minutes in front of you. (An edible apple I mean.) After a while your arm gets too heavy. It’s not so much the weight of the apple or the device that gets you. It’s the weight of holding your arm in front of you for long periods. 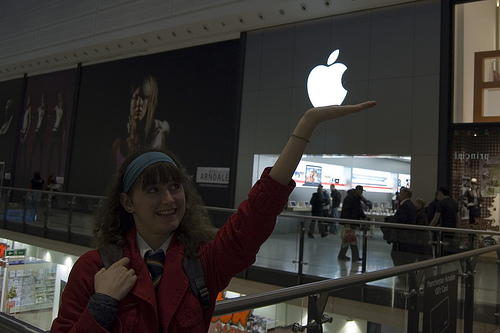 A Woman Named Rachel "holding" the Apple logo. Image from Flickr, luckmontague's photostream. Even though the woman above is not holding any weights, just keeping her arm up will make her arm and shoulders fatigue. quickly. It’s unlikely you anyone would use their iPad in this position, but it gives you an idea of how heavy your arm can be. 2. The “iDevices” are small and to see the screen you have to bend over them. Your neck has to crane to position your eyes over the keypad. 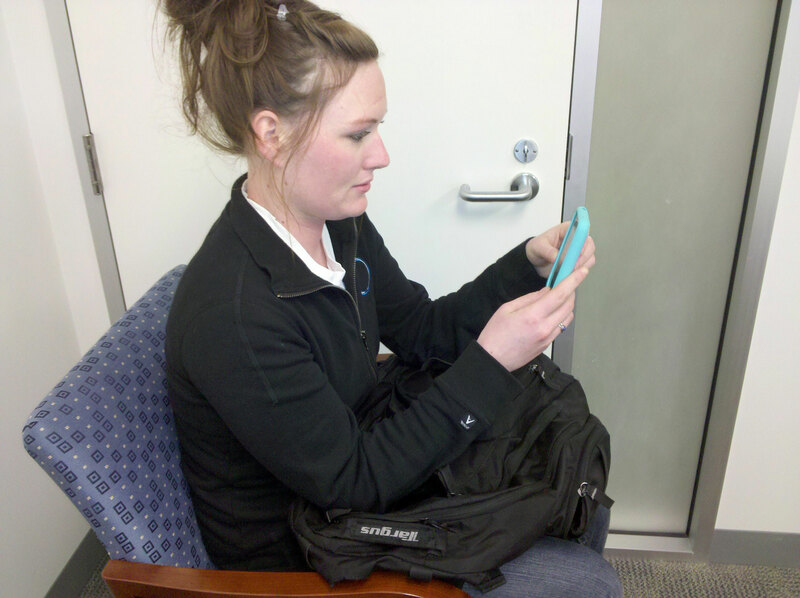 I watched a client use her new iPad yesterday. 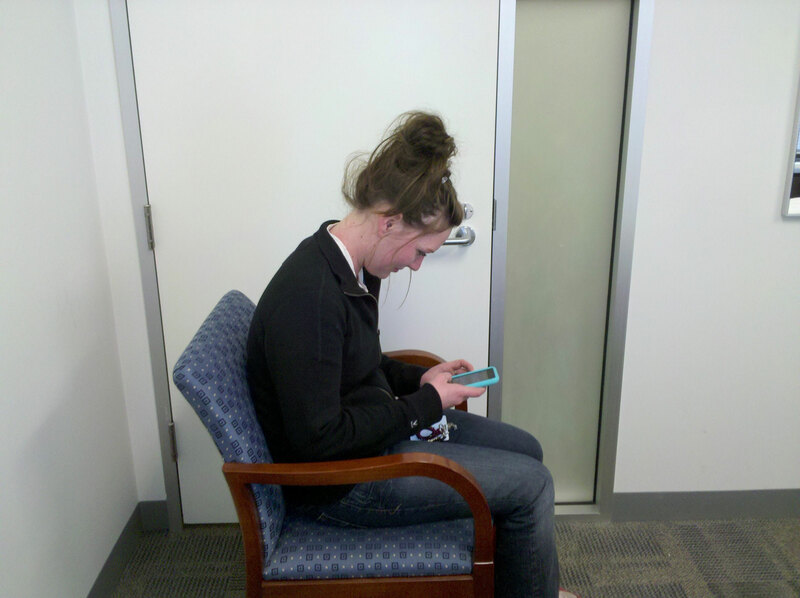 Even though she was sitting in a comfy overstuffed chair, with her legs up, resting the iPad on my knees, she still had to lean far forward and look down at the device. Thanks Apple for keeping massage therapists, physical therapists, chiropractors and orthopedic docs busy for years to come! Even Steven Jobs will need a neck and shoulder massage after using the iPad! Notice in the photo below that he is holding the iPad in his hands away from his lap unlike ads for the iPad where we see people holding the iPad on their laps. It’s a trade off in whether his neck gets tired faster from craning forward or his arms and shoulders from holding the iPad closer to his face. 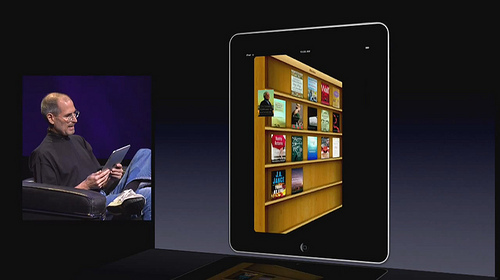 Even Steve Jobs Looks Uncomfortable Using the iPad Image from curiouslee at Flickr. 3. The touch screen is “cool” but it requires you to move your arm in front of your body at an awkward angle. using a keyboard already causes users to tighten their pectoral (chest) muscles a great deal. Tighter pectoral muscles often leads to muscle tension in muscles in the upper back and neck. Why? These back muscles have to compensate for the pec muscles literally pulling your body forward. Notice how the young man pictured below is leaning far forward over his keyboard? He is engaging his pectoral muscles and the muscles in the back of his neck and upper back are straining to hold him upright. I feel safe to say he may have some neck and shoulder pain from this position. You may think your posture is much better than his But then thick about how you sit if you work on a iPad or iPod! I don’t doubt that the new iPad will necessitate a whole slew of new products designed to hold your iPad at a more ergonomic position. 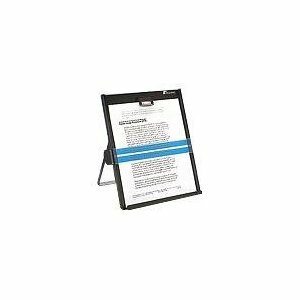 Until these come out, I recommend you use the good old Porta Book to hold your iPad at a comfortable viewing angle. 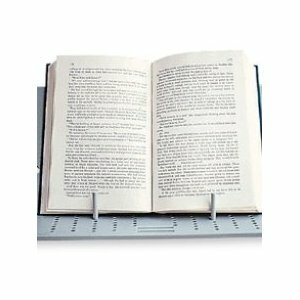 The Posta Book is inexpensive, about $20, and lightweight. And it’s available here. Or if you have a common house cat, you can make use of your pet as an iPad holder. One man did in the pic below! The ErgoLab: The Apple iPad; this Apple has a few worms.